The first thing you have to do is register on Vuforia page. After you complete the registration process, you can start developing with Vuforia SDK. You will then need a license for your project. 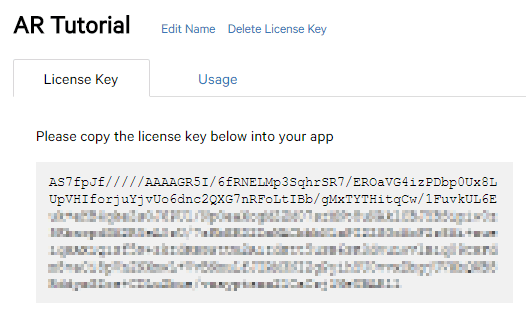 Head over to the Development tab, and click on the “Add license” button. A little form will show up. Fill in the form as shown on the side and click “Next”. Then you have to confirm your license key by agreeing with terms and conditions and by clicking “Confirm”. Pretty simple so far, right? 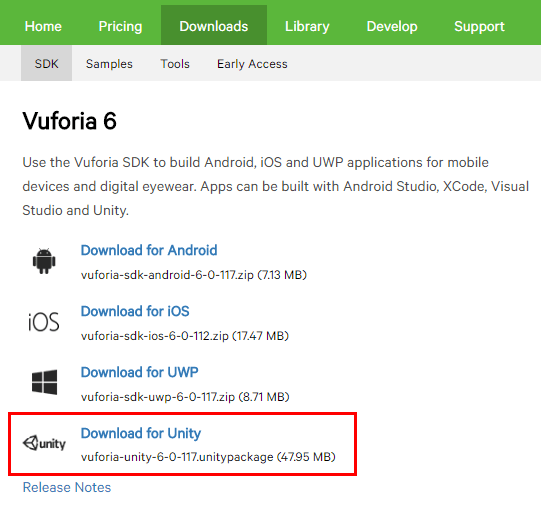 It’s time to download the Vuforia SDK for Unity. 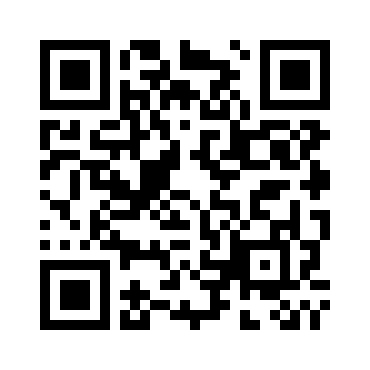 You can download it in the Vuforia Downloads tab. 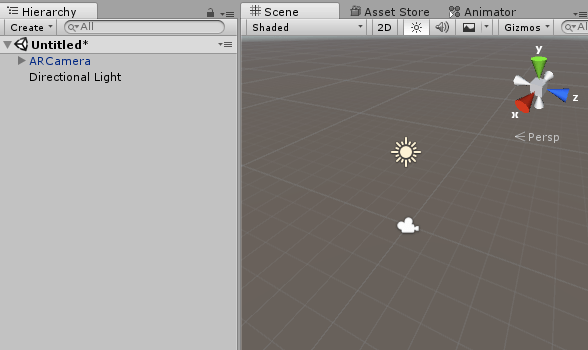 After downloading the package, import it into the existing project inside of Unity. Once you’ve got the marker, it’s time to upload it to Vuforia. Go to the Vuforia Target Manager page and click on the “Add new database” button. 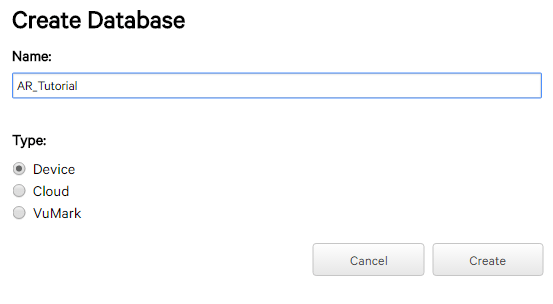 Type the preferred name for your database and choose the “Device” as a Type option. Great! Now, select the name of the database you’ve just created and then click on the “Add the new target” to the database. Select the Single Image type, pick the marker you’ve downloaded before, set the width to 1, name it the way you want it and click “Add”. Alright, so now you can see your target has been added to the list and it’s ready to be downloaded. Click “Download Database” and import the package to Unity. Now, let’s setup the ARCamera properties. ARCamera prefab requires the license key which you can find on the Vuforia License Manager Page. Copy and paste your License key to Vuforia Behaviour Script field of the ARCamera prefab on the scene. Select ARCamera in your hierarchy, and in the Database Load Behaviour tick the “Load [name] database” checkmark, then “Activate”. Alright, now it’s time to add the markers on the scene! 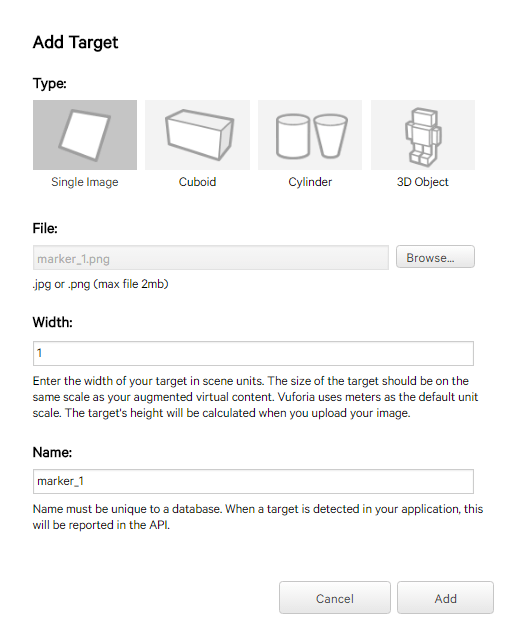 You can do it by dragging ImageTarget prefab from Vuforia > Prefabs to your scene. Great, you’re almost done! Now it’s time to add some objects to the display. Right click on the ImageTarget in the hierarchy, 3DObject > Cube. Resize the cube the way you want it and the project is ready to be compiled! Alternatively, you can add any 3D object to the hierarchy of the ImageTarget. You will need some 3D models. I’d suggest that you download and import these amazing drone models by Popup Asylum. Next, we’ll need a QR code as an additional marker. You can generate your own, but feel free to use mine if you’re lazy 🙂 Also don’t forget to upload it to the Vuforia Target Manager page and download the updated database after that. For the testing purposes you’ll need these two markers printed, so I’ve also prepared a pdf for you to download. 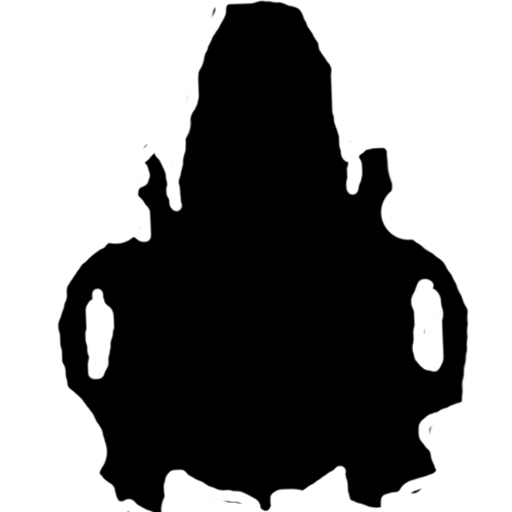 A few more textures for you to import: drone_shadow, white_ring. Alright, so we’ve got the scene, let’s now get to the main functionality… Pathfinding. So we need to bake a Nav Mesh. For more info, please, go to Unity navigation tutorial page. Baking a Nav Mesh requires a presence of a regular mesh on the scene to walk on first. 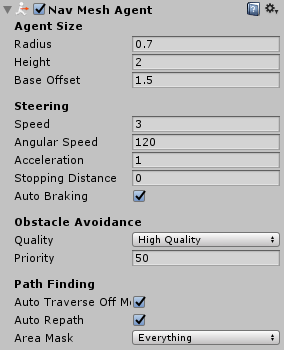 Right click on the hierarchy 3D Object > Plane. Rescale the plane so it covers an area around the markers where you potentially would like your drone to move. Now open up the navigation window (Window > Navigation) and in the Object tab make sure your plane is selected along with a “Navigation Static” checkbox. After that click “Bake”. Fantastic! If your scene looks somewhat like this, you’re on the right track! So what do we do with that annoying white plane obstructing the view? Well, it’s time for us to get rid of it. Yeah, just delete it, we won’t need it anymore, since the Nav Mesh is already baked. The initial scene setup is ready and it’s time to write some code for it to work… Create a script in one of your folders and add it to the “Drone” object (DroneTarget first child). That’s it. Just execute this function in the update and don’t forget to select the “Ring” (GoalObject child) object as a public variable in the inspector. 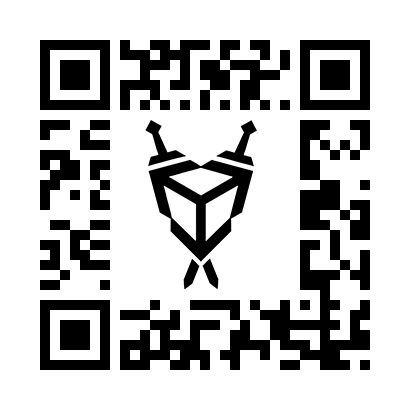 You can now build the project onto your phone and check whether it works with the markers. NOTE: The DroneMarker should always be in the camera view for the whole app to work since we’ve declared it as the world center and the whole drone logic is attached to it. You might also want your drone movement look more realistic, so let’s add movement leaning. The done will lean forward depending on its current speed. There’s a great function I use pretty often called MapRange. It converts numbers within a range to numbers within another range depending on the current value. Add PitchCtrl() to the update function and you’re good. The drone will lean forward while moving. 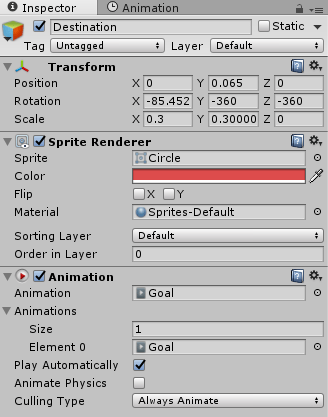 In order to setup a line renderer we should add a sprite, but don’t worry, there’s no need to import one, just head over to your project window and open the folder where you store your sprites. Hit Right click > Create > Sprites > Square. You’ve got your new sprite which we’ll use for the new material that we’re about to create. Create a new script. Let’s say the name of this script is Goal. 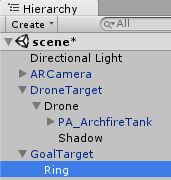 Attach the Goal script to our Ring object. Also attach line renderer component to the “Ring”. 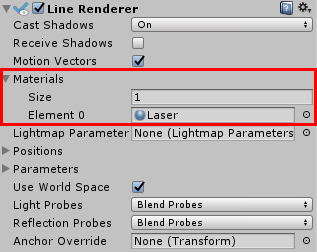 Line renderer would require a material, so please add the material we just created to it. If you run the app now, you’ll see the ring’s line/laser pointing to the drone destination. It’s great but we can also make this destination look a little bit more clear by adding another object… Just a game object containing a Sprite Renderer and Animation components. Create a public variable destSprite and update MoveToTarget() function. Thanks for reading and don’t forget to subscribe to our newsletter not to miss any of the new Unity development blog posts!